In our previous blog post we opened up the discussion about cable companies staying relevant in a day and time where the subscriber trend is to become more mobile, at the expense of home-based data consumption. As a 2014 report from Adobe already showed, more than 50% of browsing on smartphones and 93% of browsing on tablet comes from WiFi. Even as they expand their offer, cable providers still see usage limited to home or office hours. On their side, mobile operators continue to upgrade their networks to 4G (and future 5G) technology to deliver more high-quality media content; this makes them competitive in terms of service quality but also results in rising infrastructure investment. 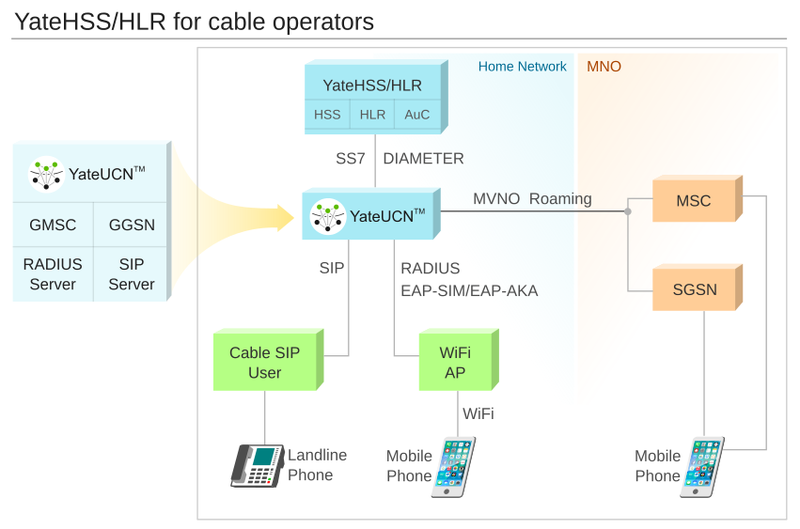 In this post we’ll see how cable companies and MNO can start providing data services using a shared infrastructure, with YateHSS/HLR and the YateUCN unified core. Mobile data offloading can be an opportunity for both operators and cable companies to provide data access to more users without incurring large expenses. Offloading enables operators to reduce the traffic load on their networks and reallocate bandwidth to other users in case of congestion, by assigning part of the traffic to a WiFi network. For cable companies, it becomes possible to serve subscribers in-between existing hotspots, making them rely primarily on the WiFi network, rather than on the cellular one. This can be done through MVNO agreements between cable operators and one or multiple MNO, so that the cable provider would share the network assets of the operator to provide carrier-class WiFi access. As MVNO, a cable company will provide its own SIMs, and its customers will register to and receive data traffic from the MNO’s network. Though some MVNO may choose to also operate their own core network, they are usually likely to hold control over billing, subscriber management and policy control functions, in which case they will only deploy an HLR and/or HSS. In fact, reports suggest that it is preferable for MVNO who offer triple or quad-play operating to deploy their own HSS/HLR (to which they can integrate policy control and AAA), because they need to provide a ‘consistent treatment of the user’ across terminals and technologies. Providing ubiquitous data access between 2G/3G/4G cellular networks and WiFi hotspots requires offloading to be done seamlessly. Most mobile devices today attempt to connect automatically to an available WiFi network, which they will remember after the first connection has been performed. To connect, once the device has detected the SSID, it proceeds to authentication, which must be done instantly and securely. In a network using the YateUCN core and the YateHSS/HLR, acting as a typical Home Subscriber Server/Home Location Register with an integrated AuC, SIM authentication is performed between the device and the Access Point, enabling the subscriber a one-time registration to the network using the IMSI stored in their SIM and the secure encryption key Ki. YateHSS/HLR and YateUCN support EAP-SIM/EAP-AKA authentication specified in the IETF standard for WiFi inter-working, securing the connection on both user and network ends. Once the device is known to the core network, YateUCN communicates with the AuC in the YateHSS/HLR using the SS7 or Diameter protocol, depending on the type of services the user has access to. As soon as the SIM is authenticated, the HSS/HLR takes over and manages the SIM and its services. YateHSS/HLR supports all the interfaces needed to communicate with the SGSN, EPC, and IMS at the same time, and provides advanced subscriber management options. As a combined HSS/HLR, it allows a subscriber to be located in simultaneous networks if, for example, they are registered to 4G LTE and paging for a CS service is required. Of course, there are also challenges for cable providers who redefine themselves as WiFi access operators. One of the main concerns is related to the use of non-SIM devices such as laptops, which, even if able to authenticate to the AP in the same way as SIM devices, have no way to then connect to a core network. While such aspects still need to be approached, the possibility of ‘WiFi-first’ networks seems a venture worthwhile for cable companies. This entry was posted in Cable operators, YateHSS/HLR, YateUCN. Bookmark the permalink.